But that doesn’t mean I spend hours in the kitchen baking, not hardly. I’m busy just like you are. So I love to have some quick recipes in mind that I can put together, from ingredients on hand, that’s are still fun and yummy. I really like to keep a few brownie and cake mixes in my pantry specifically for a fast dessert for guests. 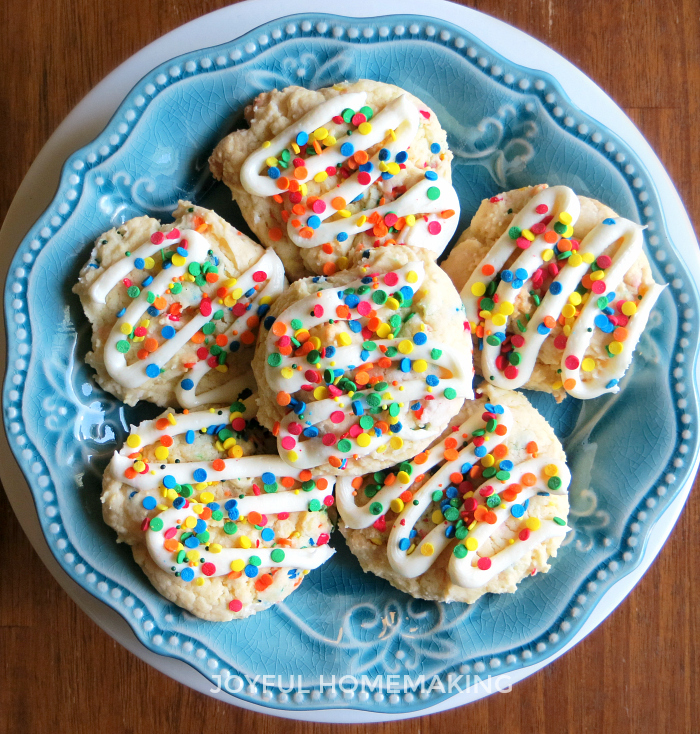 Cake mix cookies are one of my favorites. 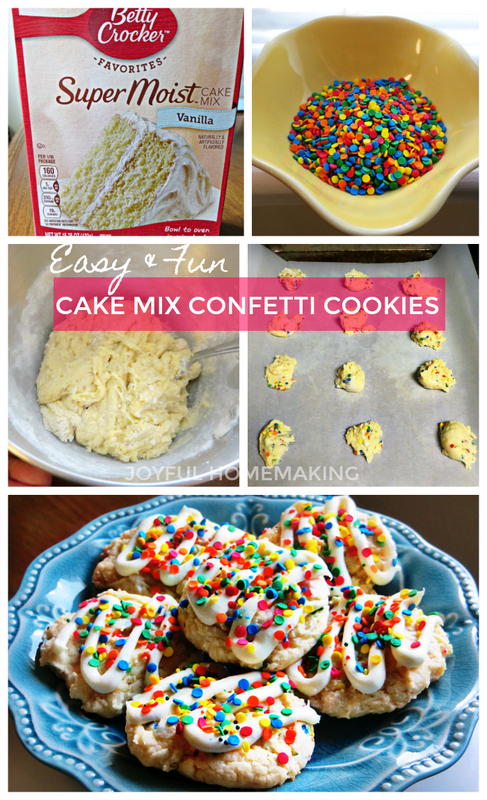 A cake mix is actually pretty versatile, so if you’re not in the mood for cake, grab a cake mix anyway and try a fruit cobbler dessert, doughnuts, blondies, rice crispy treats or these fun Cake Mix Confetti Cookies! 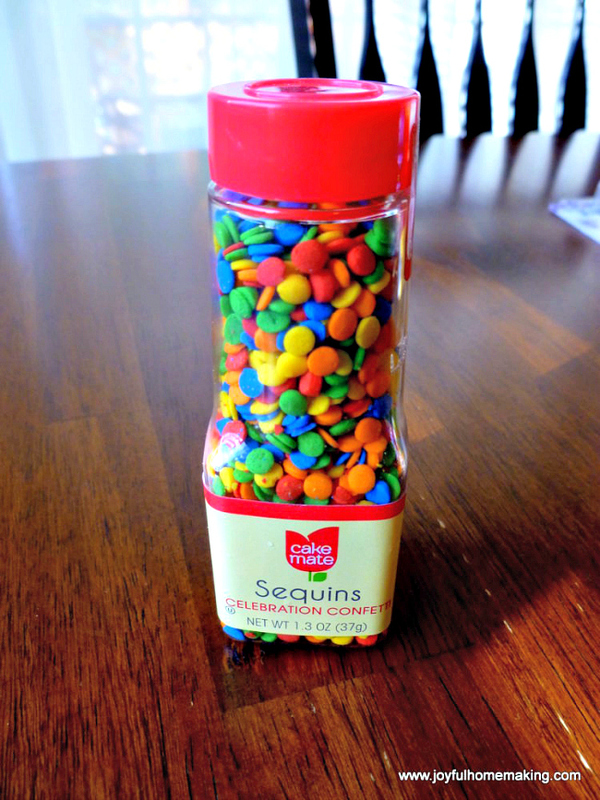 These are pretty much the only kind of sprinkles/jimmies I like; they’re the best! 🙂 If you look through the different frostings at the grocery some of them come with the sprinkles on the lid already. Step 1: Stir together the cake mix, oil and eggs. Step 2: Lightly stir in the sprinkles. Step 3: Drop by rounded teaspoonfuls onto a baking sheet covered with parchment paper or lightly sprayed with cooking oil. 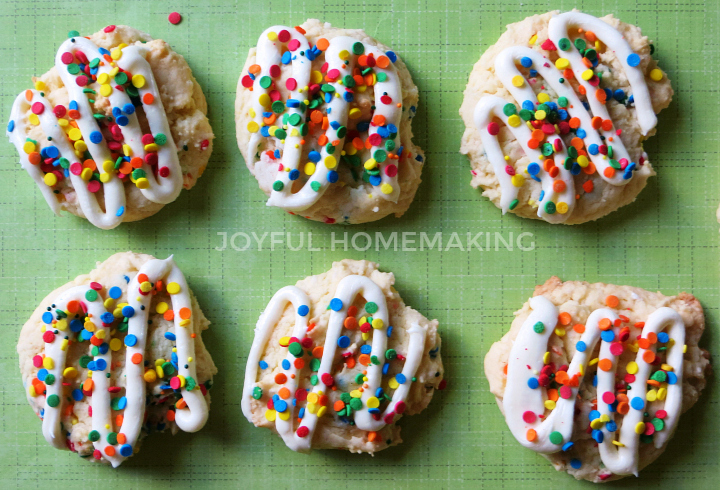 If you’re doing the right size, this should make 2 dozen cookies. Step 4: Bake in a preheated 350 degree oven for about 12 minutes. Step 5: Let cool and then frost. 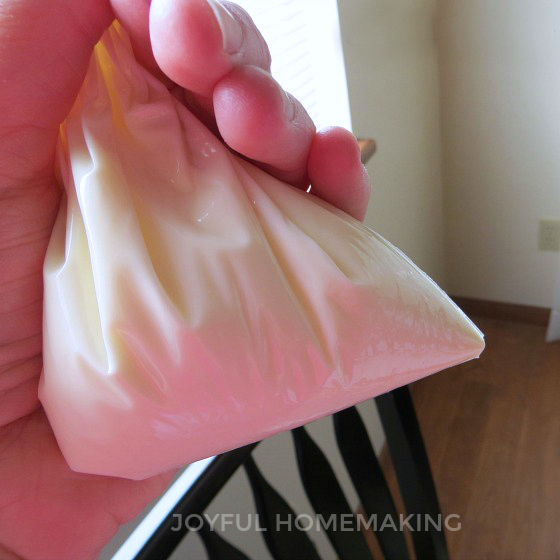 I like to use about 1/2 cup of lightly softened store bought vanilla frosting. I put it in a zip top bag, cut the tip off, and then use it to pipe on the frosting. Step 6: Sprinkle the tops with the remaining sprinkles. 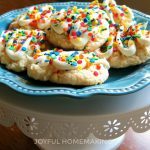 This recipe makes 24 delicious cookies. Stir together the cake mix, oil and eggs. Lightly stir in the sprinkles. Drop by rounded teaspoonfuls onto a baking sheet covered with parchment paper or lightly sprayed with cooking oil. 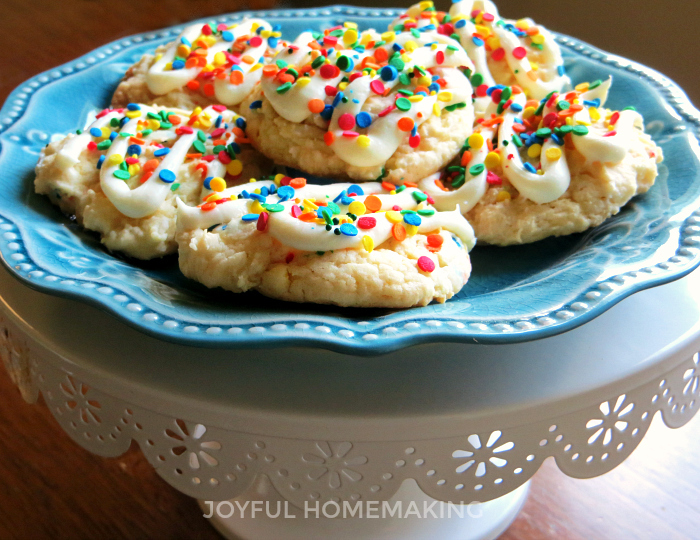 If you’re doing the right size, this should make 2 dozen cookies. Bake in a preheated 350 degree oven for about 12 minutes or till done. Let cool and then frost. I like to use about 1/2 cup of lightly softened store bought vanilla frosting. I put it in a zip top bag and cut the tip off, and pipe on the frosting. 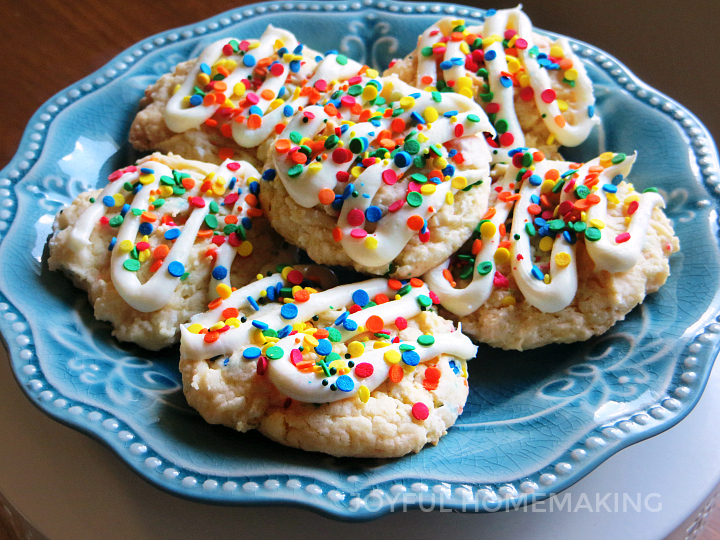 Sprinkle the tops with the remaining sprinkles. 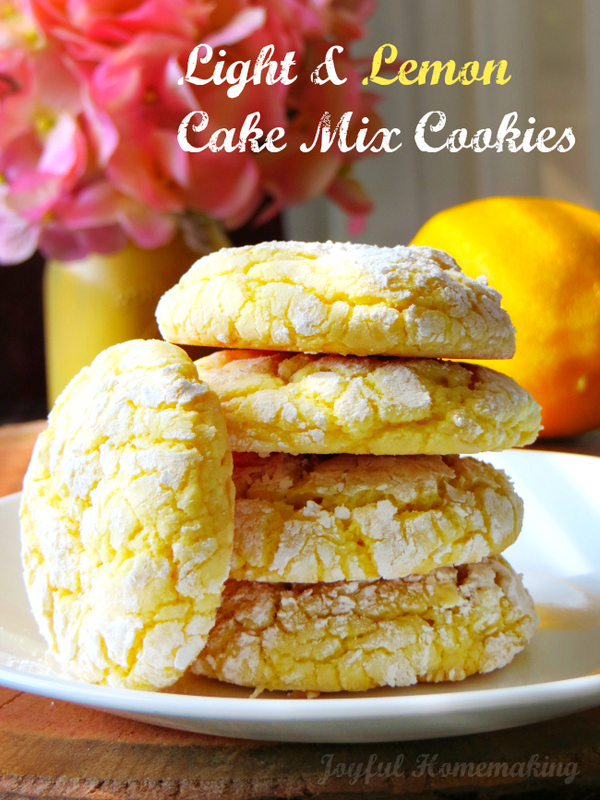 I also enjoy making Lemon Cake Mix Cookies using a lemon cake mix, see the recipe here. 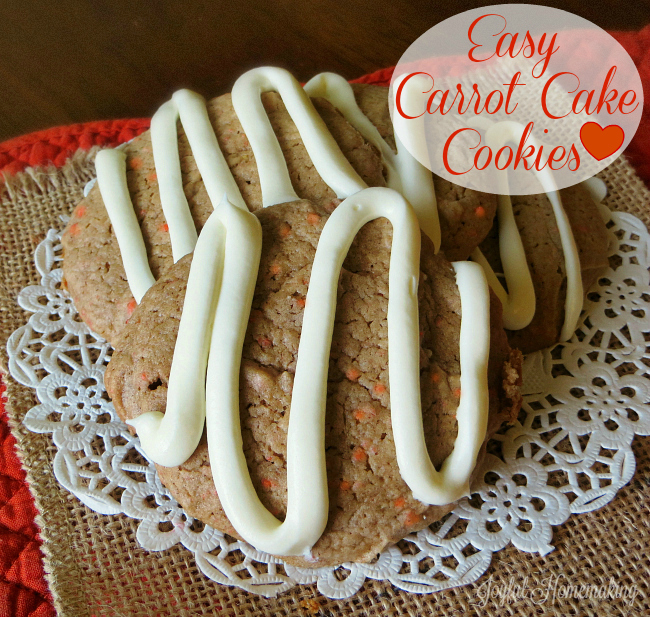 Carrot Cake Mix Cookies are scrumptious and easy too!